I was pretty geeked about how these nails turned out - which is awesome since they're mine and I'm going to be wearing them for quite a while :) I got off my ship and had my Green Cheetah nails grown out nearly 6 weeks! Eeek! So I used my e-file to drill out most of the green coloration and glitter and came up with this new set of hard glitter gel nails. I simply embedded glitter into my Light Elegance Clear builder gel, and then topped all of that off with more clear gel towards the cuticle area. I filed them into shape and then used Essie's Penny Talk and BM H12 to stamp Acorns onto the ring fingers. I capped everything with Gelish Top It Off, cured and BAM! 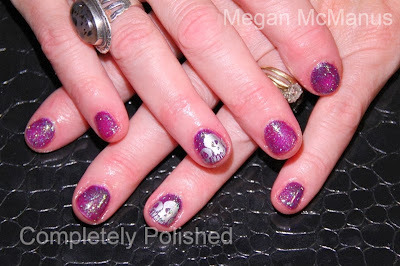 Sparkly Sparkly Nails :) Hope you like them as much as I do! This mani will burst your skull! Okay, well maybe not burst, but its pretty fantastic. 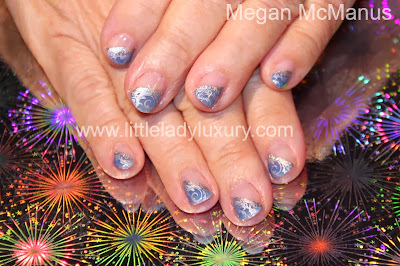 Its a simple gel manicure done using Gelish Gel Polish in Star Burst. After one layer I sprinkled on some silver glitter, and topped with 2 top coats to get a nice smooth finish. 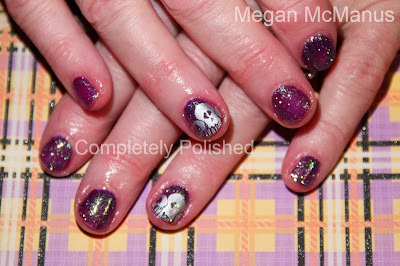 After that I stamped the skull design using Essie No Place Like Chrome and BM H07. What do you think!? I love Fall, seriously. Don't you? 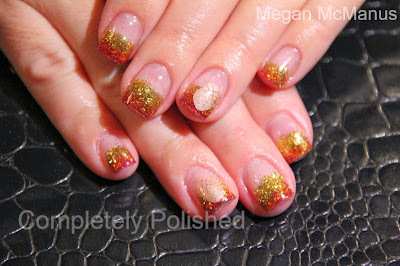 This is a set of hard gel nails. They're sculpted with Light Elegance Clear acrylic, and then filed, shaped and buffed. The french design was done with Orly's Rococo A Go-Go, done freehand. 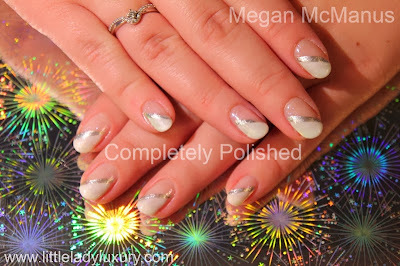 The accent finger is BM-H11 stamped with Essie No Place Like Chrome. Topped that off with two topcoats, because I didn't like the first one. I just did these nails tonight and couldn't wait to share them with you. 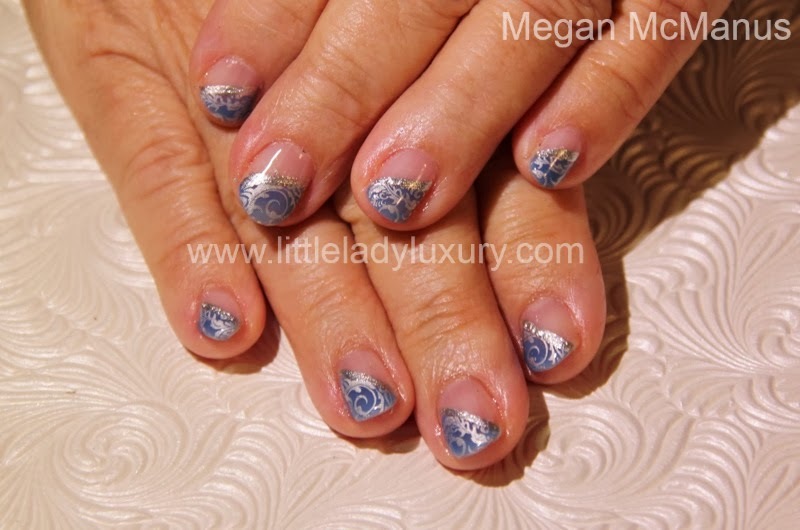 These are a set of hard gel nails (back-filled with Light Elegance Extreme Gel clear) and topped with some Gelish nail art. The pink is Gelish Light Elegant, the silver is Gelish Little Miss Sparkle and added loose silver holographic glitter, and the white is Young Nails White 101 with Essies No Place Like Chrome stamped using BM 423. I'm pretty geeked and Ashley couldn't stop looking at them. They were inspired by a Pinterest picture, but there was no watermark on it. Anyway, enjoy!